Whether a native Londoner, moving-in or just passing through, ‘London – A City Through Time’ for ipad and iphone is the perfect companion. 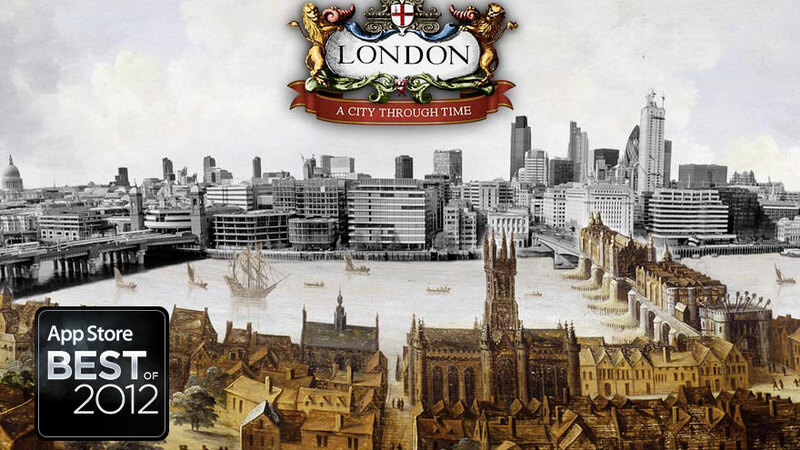 Probably the most advanced and complete portrait of London ever produced, it offers an indispensible reference to the 2000-year history of the world’s most complex city. It boasts over 6000 articles on the capital’s museums, statues, buildings, streets, trades, people, parks, rivers and more. Over 2000 rare prints and photographs. Thirty-five video documentaries and clips from the archives of the Pathé movie library. Historic panoramas of the city from the 17thCentury to the 19thCentury - all viewable as high-definition zoomable images, plus 70 gyro-controlled 360º views of the capital’s grandest sites. There are wonderfully detailed spinable artifacts from the Museum of London. It has audio tours to the haunts and hideaways of robbers and royalty from London’s official Blue Badge guides, and an unique ‘History on the Tube’ section to let you know what’s above ground when your under it. Linking everything is a synchronized time-line to help navigate with unprecedented ease through every aspect of London’s deep and amazing history. Over 6000 articles searchable by subject, date and location. Videos, 360° spins, and immersive virtual tours. Detailed historical maps and panoramas. "Even diehard Londoners are destined to discover something new." "I could (and will) happily spend all summer using this app, and still not see everything it has to offer. It's absorbing, well-crafted and the latest glimpse at an exciting future for tablet book-apps." "Amid a sea of London-related apps hoping to capitalise on this summer's Olympic Games, Heuristic Media's stands out for its craft and depth."